Prof. Ioannis Papamichail participated at a Meeting of the ECTRI Thematic Group on Traffic Management for the preparation of a Position Paper, Vienna, Austria, 24 January 2018. Prof. Markos Papageorgiou participated and delivered a presentation on "Real-time ACC exploitation for improved motorway traffic flow" at the 3rd ITS Hellas Conference on Intelligent Transport Systems and Developments in Greece, Athens, Greece, 23-24 January 2018. Profs. Markos Papageorgiou and Ioannis Papamichail participated at the 97th Annual Meeting of the Transportation Research Board, Washington, D.C., January 7-11, 2017. –	"A macroscopic multilane traffic flow model for ACC/CACC traffic dynamics"
–	"Adaptive cruise control operation for improved motorway traffic flow"
–	"Motorway path planning for automated road vehicles based on optimal control methods"
–	"Traffic flow characteristics with cooperative adaptive cruise control: An intensive study using enhanced AIMSUN". –	"Minimization of fuel consumption for vehicle trajectories". Prof. Markos Papageorgiou delivered an invited 5-day GIAN Course on "Emerging trends in advanced control system applications in Intelligent Transport Systems" at the Department of Electrical Engineering, Delhi Technological University, Delhi, India, 4-8 December 2017. Prof. Markos Papageorgiou delivered an invited 3-hour Lecture on "Automated and connected vehicles: Towards a disruptive mobility evolution?" for the. Intern. Interdepartmental MSc Program in Technology and Innovation Management, Technical University of Crete, Chania, Greece, 1 November 2017. Profs. Markos Papageorgiou, Ioannis Papamichail and Claudio Roncoli participated at the 20th IEEE Intern. Conference on Intelligent Transportation Systems (ITSC), Yokohama, Japan, October 16-19, 2017. –	"An adaptive control scheme for local and coordinated ramp metering". –	"Evaluation of an MPC strategy for motorway traffic comprising connected and automated vehicles". –	"Structural observability of multi-lane traffic with connected vehicles". –	"Validation of a per-lane traffic state estimation scheme for highways with connected vehicles". Prof. Markos Papageorgiou delivered an invited presentation on "Traffic management in the era of vehicle automation and communication systems (VACS)" at the Transport Studies Unit, TSU Tokyo Institute of Technology (Tokyo Tech), Tokyo, Japan, 16 October 2017. Prof. Markos Papageorgiou delivered an invited keynote plenary presentation on "Traffic flow modelling, simulation and operations" at the Engineering Technology Development Strategy High-End Forum - Artificial Intelligence and Simulation, 2017 China Simulation Conference, Hangzhou, China, 14-15 October 2017. Prof. Markos Papageorgiou delivered an invited presentation on "Traffic management in the era of vehicle automation and communication systems (VACS)" at the College of Civil Engineering and Architecture, Zhejiang University, Hangzhou, China, 13 October 2017. He also collaborated with Prof. Yibing Wang and his students on common research topics related to TRAMAN21. Prof. Ioannis Papamichail participated at the Annual Meeting of the ECTRI Thematic Group on Traffic Management, Brussels, Belgium, 5 October 2017. Profs. Markos Papageorgiou and Ioannis Papamichail participated at the 8th International Congress on Transportation Research, Thessaloniki, Greece, 27-29 September 2017. –	"Traffic management in the era of vehicle automation and communication systems (VACS)". –	"Integrated motorway traffic flow control". –	"Simulation investigations of the coordinated traffic-responsive signal control strategy TUC with actuation at the local junction level". Prof. Markos Papageorgiou had a teleconference enabled meeting and short discussion on TRAMAN21 with the ERC President Prof. Jean-Pierre Bourguignon, on the occasion of his visit to FORTH (Heraklion, Crete), on 20 September 2017. Dr. Nikolaos Bekiaris-Liberis participated (funded by the MSCA-IF grant PADECOT) and presented results from the paper "Highway Traffic State Estimation per Lane in the Presence of Connected Vehicles" at the 20th Meeting of the EURO Working Group on Transportation (EWGT 2017), Budapest, Hungary, 4-6 September 2017. Ms. Maria Kontorinaki participated and presented the paper "Nonlinear Feedback Control for General Acyclic Traffic Networks" at the 20th IFAC World Congress, Toulouse, France, 9-14 July 2017. Prof. Markos Papageorgiou delivered an invited presentation on "Traffic management in the era of vehicle automation and communication systems (VACS)" at the Department of Automation, Shanghai Jiao Tong University, Shanghai, China, 10 July 2017. Prof. Markos Papageorgiou participated and delivered an invited keynote plenary presentation on "Real-time ACC exploitation for improved motorway traffic flow" at the 17th COTA Intern. Conference of Transportation Professionals (CICTP 2017), Shanghai, China, July 7-9, 2017. Dr. Anastasia Spiliopoulou attended the 5th IEEE International Conference on Models and Technologies for Intelligent Transportation Systems (MT-ITS 2017) in Naples, Italy, June 26-28, 2017. She presented the paper "Exploitation of ACC systems towards improved traffic flow efficiency on motorways". Prof. Markos Papageorgiou delivered an invited presentation on "Traffic management in the era of vehicle automation and communication systems (VACS)" at Fakultät für Elektrotechnik, Helmut Schmidt University, Hamburg, Germany, 26 June 2017. Prof. Markos Papageorgiou delivered an invited presentation on "Real-time ACC exploitation for improved motorway traffic flow" at Delft Center for Systems and Control, Technical University of Delft, Delft, The Netherlands, 22 June 2017. Prof. Markos Papageorgiou was an external co-promoter for the PhD thesis "Efficient PredictiveModel-Based and Fuzzy Control for Green Urban Mobility" by Anahita Jamshidnejad at the Technical University of Delft, The Netherlands. The thesis defense took place on 22 June 2017. Prof. Markos Papageorgiou participated and delivered an invited presentation on "Traffic management issues in C-ART (Coordinated Automated Road Transport)" at the Stakeholders’ Workshop on Challenges & Opportunities of Coordinated Automated Road Transport (C-ART). Brussels, Belgium, 12-13 June, 2017. Prof. Markos Papageorgiou participated and delivered an invited presentation on "Real-time ACC exploitation for improved motorway traffic flow" at the Workshop on Smart Mobility. Junglinster, Luxembourg, June 1-2, 2017. Associate Professor Ioannis K. Nikolos attended The Fifth International Conference on Parallel, Distributed, Grid and Cloud Computing for Engineering (PARENG2017), in Pecs, Hungary, on May 30-31, 2017, where he presented the following paper: G.A. Strofylas, K.N. Porfyri, I.K. Nikolos, A. I. Delis, M. Papageorgiou, "Calibrating a Traffic Flow Model with Parallel Differential Evolution", Proceedings of the Fifth International Conference on Parallel, Distributed, Grid and Cloud Computing for Engineering, P. Ivanyi, B.H.V. Topping and G. Varady (Editors), Civil-Comp Press, Stirlingshire, Scotland, 2017. Prof. Markos Papageorgiou delivered an invited presentation on "Traffic management in the era of vehicle automation and communication systems (VACS)" at DLR – Deutsches Zentrum für Luft- und Raumfahrt , Berlin, Germany, 10 April 2017. –	"Freeway traffic management in the era of vehicle automation and communication systems (VACS)"
at the 2017 EURO Winter Institute on Methods and Models in Transportation Problems (2017 WI- EWGT), Bressanone, Italy, 14-23 February 2017. –	"Lane-changing feedback control for efficient lane assignment at motorway bottlenecks"
–	"Balancing delays and relative queues at the urban network periphery under perimeter control"
–	"Calibration and validation of a macroscopic multi-lane traffic flow model using a Differential Evolution Algorithm"
–	"Cooperative vehicle merging on highways: Model predictive control"
–	"Simulation study of centralized versus decentralized approaches to signal control of large-scale urban networks". Prof. Papageorgiou was also invited to present "TRAMAN21: Update on Progress" at the TFTC Committee Meeting on January 11, 2017; as well as "Freeway traffic management in the era of vehicle automation and communication systems (VACS)" at the Workshop on "Active Transportation Operation and Demand Management in Connected/Automated Traffic Systems: Data Collection and Analytics, Modeling and Control" on January 12, 2017. Prof. Ioannis K. Nikolos served as Track Co-organizer (16-3: Transportation Systems Dynamics and Controls) and Session Co-organizer (16-3-1: Transportation Systems Dynamics and Controls) at the ASME 2016 International Mechanical Engineering Congress & Exposition (IMECE2016), Phoenix, Arizona, USA, November 11-17, 2016. He chaired the session "16-3-1: Transportation Systems Dynamics and Controls" and he also presented the following paper: K.N. Porfyri, I.K. Nikolos, A.I. Delis, M. Papageorgiou, "Nonlinear stability analysis of a macroscopic traffic flow model for Adaptive Cruise Control systems". Prof. Markos Papageorgiou participated and delivered a presentation on "Automated tuning of ITS algorithms: Results from real-life application" at the 2nd ITS Hellas Conference on Intelligent Transport Systems and Developments in Greece, Athens, Greece, 19-20 December 2016. Prof. Argiris Delis participated at the 19th IEEE Intern. Conference on Intelligent Transportation Systems, Rio de Janeiro, Brazil, November 1-4, 2016. He presented two papers titled "Simulation of the penetration rate effects of ACC and CACC on macroscopic traffic dynamics" and "Calibration of a second-order traffic flow model using a metamodel-assisted Differential Evolution algorithm," and chaired the two sessions on Modeling and Simulation I & II. Dr. Bekiaris-Liberis participated at the 2016 IEEE Multi-Conference on Systems and Control, Buenos Aires, Argentina, September 19-22, 2016. He delivered the presentation of the paper “Predictor-based adaptive cruise control design". Prof. Markos Papageorgiou was an external member (and chairman) of the doctoral committee for the PhD thesis "Etude des instabilités dans les modèles de trafic" by Rémi Sainct at the Université Paris-Est, France. The thesis defense took place on 22 September 2016. Prof. Markos Papageorgiou participated and delivered an invited presentation on "Future Traffic Management: Towards a Cyber-Physical System Network" at the International Symposium on Networked Cyber-Physical Systems (NET-CPS 2016) at the TUM Institute for Advanced Study, Technical University of Munich, Germany, 19-20 September 2016. Prof. Markos Papageorgiou delivered an invited 2-hour lecture on “Freeway Traffic Control: An Overview” at the 37th Summer School of Automatic Control on Advanced Algorithms for Traffic Prediction and Control, Gipsa-Lab, Grenoble, France, September 12-16, 2016. Prof. Markos Papageorgiou participated and delivered an invited presentation on "Complex System Problems in Road Traffic Control" at the Complexity Science Workshop at the Systems & Control Research Centre, School of Mathematics, Computer Science and Engineering, City University London, U.K., 21-22 July 2016. Ms. Maria Kontorinaki participated and presented the paper "Nonlinear Adaptive Control Scheme for Discrete-Time Systems with Application to Freeway Traffic Flow Networks" at the 15th annual European Control Conference (ECC 2016), Aalborg, Denmark, 29 June-1 July 2016. Prof. Argiris Delis delivered an invited presentation titled "On the macroscopic modeling of traffic flow: developments and simulation" at the Numerical Analysis Seminar, University of Nice Sophia-Antipolis, Nice, France, 9 June 2016. 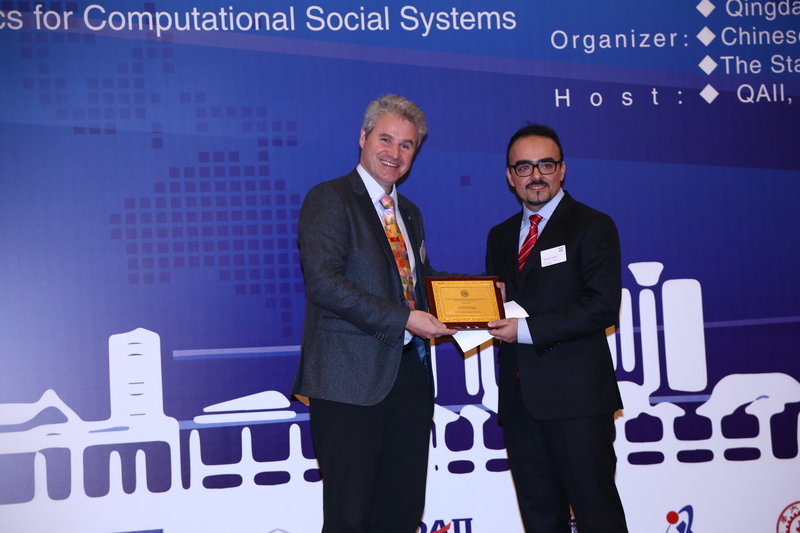 Prof. Ioannis Papamichail and Dr. Nikolaos Bekiaris-Liberis participated at the 14th IFAC Symposium on Control in Transportation Systems, Istanbul, Turkey, May 18-20, 2016. They delivered two presentations titled "Feedback-based integrated motorway traffic flow control with delay balancing" and "Highway Traffic State Estimation with Mixed Connected and Conventional Vehicles". Prof. Markos Papageorgiou delivered an invited presentation on "Traffic management in the era of vehicle automation and communication systems (VACS)" at the 9th Panhellenic Conference of Electrical Engineering and Computer Science Students, Chania, Greece, 20-22 April 2016. Prof. Markos Papageorgiou was an external member of the doctoral committee for the PhD thesis "Control methods for sustainable mobility in multi-class freeway networks" by Cecilia Pasquale at the Università degli Studi di Genova, Italy. The thesis defense took place on 7 April 2016. Prof. Markos Papageorgiou was an external member of the doctoral committee for the PhD thesis "Traffic Flow at Sags: Theory, Modeling and Control" by Bernat Goñi-Ros at the Technical University of Delft, The Netherlands. The thesis defense took place on 21 March 2016. Prof. Markos Papageorgiou delivered an invited presentation on "Traffic management in the era of vehicle automation and communication systems (VACS)" at the Master Class Road Traffic Modelling and Control, TRAIL Research School for Transport, Infrastructure and Logistics, Delft, The Netherlands, 21 March 2016. Prof. Markos Papageorgiou delivered an invited presentation on "Freeway traffic management in the era of vehicle automation and communication systems (VACS)" at the Séminaire Modélisation des Réseaux de Transport, IFSTTAR & ENPC, Paris, France, 25 February 2016. Prof. Markos Papageorgiou participated, as an invited external jury member, at the intermediate presentation in the frame of the Habilitation procedure of Dr. Marion Leibold on "Optimality and Optimal Control in Robot Motion Planning" at the Faculty of Electrical and Computer Engineering, Technical University of Munich, Germany, on 28 January 2016. Prof. Markos Papageorgiou and Dr. Claudio Roncoli participated at the 95th Annual Meeting of the Transportation Research Board, Washington, D.C., January 10-14, 2016. They delivered three presentations titled "Highway traffic state estimation using speed measurements: Case studies on NGSIM data and Highway A20 in the Netherlands", "Real-time merging traffic control at congested freeway off-ramp areas", and "Capacity drop in first-order traffic flow models: Overview and real-data validation". Prof. Papageorgiou was also invited to present "TRAMAN21: Motivation and scope" at the TFTC Committee Meeting on January 13, 2016. Prof. Markos Papageorgiou was a member of the jury and rapporteur for the PhD thesis "Affectation dynamique dans les systèmes de transport multimodaux" by Dihya Atmani at the Université Paris-Est, France . The thesis defense took place on 18 December 2015. Prof. Markos Papageorgiou participated and delivered a presentation on "Practical tools for traffic flow surveillance and control" at the ITS Hellas Conference on Intelligent Transport Systems and Developments in Greece, Athens, Greece, 15-16 December 2015. Dr. Bekiaris-Liberis participated at the 54th IEEE Conference on Decision and Control, Osaka, Japan, December 15-18, 2015. He delivered the presentation of the paper "Predictor-feedback stabilization of multi-input nonlinear systems". Prof. Markos Papageorgiou participated and delivered an invited presentation on "Active traffic management and new technologies" at the Symposium on Challenges in Urban Mobility. Universitat Politècnica de Catalunya, Barcelona, Spain, 16 November 2015. Prof. Ioannis K. Nikolos participated at the ASME 2015 International Mechanical Engineering Congress and Exposition IMECE2015, November 13-19, 2015, Houston, Texas, USA, where he co-chaired a session on "Vehicle Stability and Control Systems" and presented a paper on "Stability Analysis of a Macroscopic Traffic Flow Model for Adaptive Cruise Control Systems". Prof Ioannis Papamichail delivered an invited plenary presentation on "Feedback-based integrated motorway traffic flow control" at the International Conference on Advanced Computing for Innovation (ACOMIN2015), Sofia, Bulgaria, 10-11 November 2015. Dr. Bekiaris-Liberis participated at the Opening Ceremony of the Large Scale Demonstration of Public Transport Automated Vehicles, Trikala, Greece, November 10, 2015. Prof. Markos Papageorgiou, Prof. Ioannis Papamichail, and Dr. Claudio Roncoli participated at the Workshop on Traffic Control, part of the Long Program New Directions in Mathematical Approaches for Traffic Flow Management, organised by the Institute for Pure & Applied Mathematics (IPAM), University of California Los Angeles (UCLA), California, USA, 26-30 October 2015. They delivered three invited presentations titled "Freeway traffic management in the era of VACS (Vehicle Automation and Communication Systems) ", "Integrated feedback-based ramp metering and mainstream traffic flow control for multiple bottlenecks on motorways", and "Network-wide motorway traffic control in presence of Vehicle Automation and Communication Systems". Prof. Markos Papageorgiou participated and delivered an invited presentation on "Traffic Management for the 21st Century" at the iMobility Forum Plenary Meeting on Automation Impact for Vehicles, Infrastructure and Users, Brussels, Belgium, 21 October 2015. Prof. Markos Papageorgiou delivered an invited plenary presentation on "Freeway traffic control" at the 19th Intern. Conference on System Theory, Control and Computing (ICSTCC 2015), Cheile Gradistei, Romania, October 14 - 16, 2015. Prof. Markos Papageorgiou was a member of the jury for the PhD thesis "Traffic Eco-Management in Urban Traffic Networks" by Giovanni de Nunzio, at the University of Grenoble, France. The thesis defense took place on 2 October 2015. Prof. Markos Papageorgiou delivered an invited presentation on "Optimal control for multi-lane motorways in presence of vehicle automation and communication systems" at the Mini-Workshop on Modeling and Control of Traffic Systems, Université de Grenoble, Grenoble, France, 1 October 2015. Prof. Markos Papageorgiou, Prof. Ioannis Nikolos, and Dr. Claudio Roncoli participated at the 18th IEEE Intern. Conference on Intelligent Transportation Systems, Las Palmas de Gran Canaria, Spain, September 15-18, 2015. Prof. Papageorgiou delivered an invited keynote presentation titled "Freeway traffic management in the era of vehicle automation and communication systems (VACS)". Prof. Nikolos presented two papers titled "Macroscopic modelling and simulation of ACC and CACC traffic" and "Macroscopic modelling and simulation of multi-lane traffic". Dr. Roncoli presented a paper titled "Highway traffic state estimation with mixed connected and conventional vehicles using speed measurements". Prof. Markos Papageorgiou delivered an invited webinar on "Freeway traffic management in the era of vehicle automation and communication systems (VACS)" which was organised by the European VRA (Vehicle and Road Automation) project on 4 September 2015. Dr. Claudio Roncoli participated and presented a paper on "Model predictive control for motorways in presence of mixed manual and VACS-equipped vehicles" at the 18th meeting of the EURO Working Group on Transportation (EWGT2015), Delft, The Netherlands, 14-16 July 2015. Ms. Maria Kontorinaki participated and presented a paper on "Global Exponential Stabilization of Freeway Models" at the 14th annual European Control Conference (ECC 2015), Linz, Austria, 15-17 July 2015. Prof. Markos Papageorgiou delivered an invited tutorial presentation on "Experience and advice for publishing in good scientific journals" at a Special Workshop for Graduate Students, Wuhan University of Technology, Wuhan, China, 27 June 2015. Prof. Markos Papageorgiou was a member of the jury for the PhD thesis "Model Predictive Control for Freeway Traffic Networks" by José Ramón Dominguez Frejo, at the University of Seville, Spain. The thesis defense took place on 18 June 2015. Dr. Christina Diakaki and Dr. Diamantis Manolis participated at the Workshop on Achievements in Systems of Systems Research and Innovation, Florence, Italy, May 28, 2015. Prof. Markos Papageorgiou delivered on 17 April 2015 two invited presentations at the Technical University of Munich. The first presentation on "Freeway traffic management in the era of vehicle automation and communication systems (VACS)" was given at the Chair of Traffic Engineering and Control (LINK): to the attached announcement); the second presentation on "Traffic management in presence of vehicle automation and communication systems (VACS)" was given at the Workshop on Automation and Robotics in honour of Professor Günther Schmidt on his 80th birthday, Chair of Automatic Control Engineering. Prof. Markos Papageorgiou visited on 16 April 2015 the premises of BMW Group Forschung und Technik in Munich, Germany, and had interesting discussions with BMW colleagues working in the area of vehicle automation. He was informed about the impressive work and advancements achieved by that group and had also a chance to see one of BMW’s famous automated cars. On his turn, he had a chance to present the scope and philosophy of TRAMAN21 work. Both parties agreed to continue and intensify the contact and exchange started recently with mutual benefits. Prof. Markos Papageorgiou delivered an invited keynote presentation on "Traffic management in the era of vehicle automation and communication systems (VACS)" at the Symposium on Smart Mobility on the Road, DITCM Automotive Campus, Helmond, The Netherlands, 30 March 2015. Prof. Markos Papageorgiou delivered an invited 2-hour lecture on "Freeway Traffic Control" at the Facoltà di Ingegneria Civile ed Industriale, Università di Roma "La Sapienza", Rome, Italy, on 20 March 2015. Prof. Markos Papageorgiou and Dr. Claudio Roncoli participated at the 94th Annual Transportation Research Board (TRB) Meeting, Washington, D.C., USA, 11-15 January 2015. They presented two works titled "An optimisation-oriented first-order multi-lane model for motorway traffic" and "Traffic management in presence of Vehicle Automation and Communication Systems: the project TRAMAN21". Prof. Markos Papageorgiou delivered an invited presentation on "Optimal control for multi-lane motorways in presence of vehicle automation and communication systems" at the Seminar on “Transportation Networks Modeling”, IFSTTAR, Paris, France, 18 December 2014. Prof. Ioannis K. Nikolos participated at the ASME 2014 International Mechanical Engineering Congress and Exposition (IMECE2014), November 14-20, 2014, Montreal, Quebec, Canada, where he organized and chaired a session on "Advanced Automotive Systems and Methodologies", and presented a paper on "Assessing the impact of a cooperative merging system on highway traffic using a microscopic flow simulator". Prof. Markos Papageorgiou was a member of the jury and rapporteur for the PhD thesis "Traffic Modeling, Estimation and Control for Large-Scale Congested Urban Networks” by Mohsen Ramezani Ghalenoei, at the Ecole Polytechnique Fédérale de Lausanne (EPFL), Switzerland. The thesis defense took place on 30 October 2014. Prof. Markos Papageorgiou was a member of the jury and rapporteur for the PhD thesis "Observation empirique et modélisation des discontinuités du réseau autoroutier: Vers l’estimation des capacités" by Florian Marczak at the Ecole Nationale des Travaux Publics d’Etat (ENTPE), Lyon, France. The thesis defense took place on 28 October 2014. Prof. Markos Papageorgiou delivered an invited presentation on "Freeway traffic management in presence of VACS (Vehicle Automation and Communication Systems)" at AVL Turkey, Gebze, Turkey, 23 October 2014. Prof. Markos Papageorgiou participated at the 11th Intern. Congress on Advances in Civil Engineering (ACE 2014), Istanbul, Turkey, 21-25 October 2014. He delivered an invited keynote plenary presentation on "Freeway traffic control: Past, present and future" and a regular presentation on "Calibration of two macroscopic traffic flow models using a genetic algorithm". Prof. Markos Papageorgiou was an invited participant at the Intern. Symposium on Recent Advances in Intelligent Transportation Systems and Traffic Flow Theory: The Frontier and Challenges, College of Civil Engineering and Architecture, Zhejiang University, Hangzhou, China, 13-14 October 2014. He delivered an invited keynote presentation on "Traffic management in the era of vehicle automation and communication systems (VACS)"" and an invited presentation on "Application of advanced nonlinear discrete-time control concepts to road traffic control problems". Prof. Markos Papageorgiou participated at the 17th Intern. IEEE Conference on Intelligent Transportation Systems (ITSC 2014), Qingdao, China, October 8-11, 2014. He delivered a presentation on "Model-predictive control for multi-lane motorways in presence of VACS (Vehicle automation and communication systems)". Prof. Ioannis K. Nikolos participated and presented a paper on "Relaxation approximations to second-order traffic flow models by high-resolution schemes" at the 12th International Conference of Numerical Analysis and Applied Mathematics (ICNAAM 2014), Rhodes, Greece, 22-28 September 2014. Prof. Markos Papageorgiou participated at the ERC Workshop for Principal Investigators, Athens, Greece, 25 September 2014, organised by the ERCEA Grant Management Department in cooperation with the Greek National Documentation Centre (EKT/NHRF). Prof. Argiris I. Delis delivered an invited seminar (Séminaire de Mathématiques Appliquées) on "On the numerical solution of second-order traffic flow models" at the Institut de Mathématiques de Bordeaux (IMB) and Inria Bordeaux - Sud-Ouest Research Centre, France on 23 September 2014. Prof. Markos Papageorgiou participated at the XLI (National) Symposium on Operations Research (SYM-OP-IS 2014), Divcibare, Serbia, 16-19 September 2014. He delivered an invited plenary presentation on "Freeway traffic control: Past, present and future". Prof. Markos Papageorgiou was a member of the jury for the PhD thesis "Contribution à l’ étude du traffic routier sur réseaux à l’ aide des équations d’ Hamilton-Jacobi" by Guillaume Costeseque at the Université Paris-Est, France. The thesis defense took place on 12 September 2014. Dr. Christina Diakaki participated at the Automotive Megatrends Europe 2014 Conference, Brussels, Belgium, 10-11 September 2014. Prof. Ioannis Papamichail participated and presented two papers on "Optimal control for multi-lane motorways in presence of vehicle automation and communication systems" and on "A feedback-based approach for mainstream traffic flow control of multiple bottlenecks on motorways" at the 19th IFAC World Congress (IFAC'14), Cape Town, South Africa, August 24-29, 2014. Prof. Markos Papageorgiou participated at the TRB/AUVSI Automated Vehicles Symposium 2014, San Francisco, California, July 15-17 2014. He delivered an invited plenary presentation on "Challenges and Prerequisites for Vehicle Automation: Traffic Management Issues". He was involved in the organisation of the breakout sessions on Roadway Management and Operations with Automated Vehicles and delivered an invited presentation on "Centralised versus decentralised freeway traffic management in presence of VACS". Dr. Claudio Roncoli participated and delivered a presentation on "Optimal control for multi-lane motorways in presence of vehicle automation and communication systems" at the 20th Conference of the International Federation of Operational Research Societies (IFORS), Barcelona, Spain, July 13-18, 2014. Mr. Ioannis Ntousakis participated and presented a paper on "Microscopic Modelling of Adaptive Cruise Control Systems" at the 4th International Symposium of Transport Simulation (ISTS) & International Workshop on Traffic Data Collection and its Standardisation (IWTDCS), Ajaccio, France, June 1-4, 2014. Prof. Markos Papageorgiou participated at the International Conference on Engineering and Applied Science Optimization (OPT-i), Kos, Greece, 4-6 June 2014. He delivered an invited plenary presentation on "Optimal control as a source of intelligent behaviour in engineering systems" and a regular presentation on "Motorway flow optimization in presence of vehicle automation and communication systems". Prof. Iasson Karafyllis participated and presented a paper on "Stability investigation for simple PI-controlled traffic systems" at the 6th International Symposium on Communications, Controls, and Signal Processing, Athens, Greece, May 21-23, 2014. Prof. Markos Papageorgiou delivered an invited seminar on "Freeway Traffic Control: Past, Present and Future" at the Centre for Smart Transportation, Department of Civil and Environmental Engineering, University of Alberta, Edmonton, Canada, on 29 April 2014. Prof. Markos Papageorgiou delivered an invited talk on "Variable Speed Limits: An Innovative Application Approach" at Edmonton's 6th Annual International Conference on Urban Traffic Safety, Edmonton, Canada, 28 April - 2 May 2014. Prof. Markos Papageorgiou delivered an invited 3-hour lecture on “Freeway Traffic Control” at the Department of Computer Science, Bioengineering, Robotics and Systems Engineering, University of Genova, Savona, Italy, on 3 April 2014. Prof. Markos Papageorgiou participated and presented a paper on “Vision of Mobility 2050 - Traffic Management Aspects” at the ERTICO Workshop on ITS-Mobility 2040-2050, Athens, Greece, 5-7 February 2014. Prof. Markos Papageorgiou participated at the 11th Meeting of the Working Group on Road Automation of the iMobility Forum in Brussels, Belgium, on 24 January 2014. Prof. Ioannis Papamichail participated and presented a paper on “Evaluation of HERO installation at M1-M3 Freeway in Queensland, Australia” at the 93rd Annual Meeting of the Transportation Research Board, Washington, D.C., January 12-16, 2014. Prof. Markos Papageorgiou delivered an invited presentation on “Freeway traffic management in presence of VACS (Vehicle Automation and Communication Systems)" at the 93rd Annual Meeting of the Transportation Research Board, Washington, D.C., January 12-16, 2014. Prof. Markos Papageorgiou delivered an invited honorary webinar on “Freeway Traffic Control: Past, Present and Future” which was organised by the Committee on Traffic Flow Theory and Characteristics of the TRB (Transportation Research Board) on 19 December 2013. Mr. Ioannis Ntousakis attended the 3rd"Models and Technologies for Intelligent Transportation Systems - MT-ITS" conference in Dresden, Germany, 2-4 December 2013. His participation was partially covered by a DAAD grant (German Academic Exchange Service). Prof. Markos Papageorgiou delivered an invited keynote speech on "The Importance of Traffic Flow Modelling for Improved Traffic Operations" at the MULTITUDE Final Conference, Naples, Italy, 4-6 December 2013. Prof. Markos Papageorgiou delivered an invited plenary talk on "Traffic Control: Past, Present and Future" at the First International Conference on Future Traffic: Green City and Smart Transport, Ningbo, China, 7-8 November 2013. Prof. Markos Papageorgiou participated at the 10th Meeting of the Working Group on Road Automation of the iMobility Forum in Brussels, Belgium, on 2 October 2013. Prof. Markos Papageorgiou was invited to present "TRAMAN21: Motivation and Scope" at the VRA-Support Action European Concertation Meeting #1, Brussels, Belgium, on 1 October 2013. Prof. Ioannis Papamichail delivered an invited talk on "Traffic control using microscopic simulation tools" at the 4th MULTITUDE Summer School 2013 on “Uncertainty in traffic simulation”, Maria Tsakos Foundation, Chios, Greece, 5 September 2013. Mr. Ioannis Ntousakis and Ms. Kallirroi Porfyri participated at the 4th MULTITUDE Summer School 2013 on “Uncertainty in traffic simulation”, Maria Tsakos Foundation, Chios, Greece, 3-6 September 2013. Prof. Markos Papageorgiou delivered an invited talk on "Future traffic management concepts and challenges" at the Masterclass on “The Future of Traffic Management”, Traffic Quest, Noordwijk, The Netherlands, 16 July 2013. Prof. Markos Papageorgiou participated at the 9th meeting of the Working Group on Road Automation of the iMobility Forum in Brussels, Belgium, on 9 July 2013. Prof. Markos Papageorgiou delivered an invited keynote talk on "Freeway traffic control" at the 3rd Annual KIOS Workshop, University of Cyprus, Nicosia, Cyprus, on 25 June 2013. Prof. Markos Papageorgiou and Prof. Ioannis Papamichail participated at the NEARCTIS Final Event at the Trinity College in Dublin, Ireland, on 6 June 2013. Prof. Papageorgiou delivered a keynote presentation on "Cooperative traffic flow modelling and control". Prof. Ioannis Nikolos participated at the Workshop TRAM2 - Traffic Modeling and Management: Trends and Perspectives, INRIA, Sophia Antipolis, France, March 20-22, 2013. Prof. Markos Papageorgiou participated at the 7th meeting of the Automation Working Group of the iMobility Forum, Brussels, Belgium, March 8, 2013. Prof. Markos Papageorgiou participated at the Workshop on Automation in Road Transport of the iMobility Forum, Brussels, Belgium, March 7, 2013.